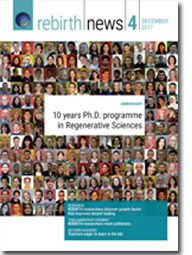 In October 2007 the PhD program ‘Regenerative Sciences' started. The PhD program was developed as part of the Cluster of Excellence REBIRTH - ‘From Regenerative Biology to Reconstructive Therapy'. The interdisciplinary program integrates all scientific and technological disciplines that are relevant for regenerative medicine. At the same time the PhD program Regenerative Sciences is integrated in the Graduate School of Excellence HBRS - Hannover Biomedical Research School. PhD students enrolled in the program thus profit from extensive experience in two different though complementary areas: they are part of a lively and diverse scientific community in regenerative medicine as well as integrated into a graduate school hosting a diversity of different programs with long years of experience in teaching graduate students from a large variety of backgrounds. Each year up to 20 students from all over the world are accepted into the program. Students who hold a M.Sc. or equivalent degree in Medicine, Veterinary Medicine, Life or Natural Sciences, or a biomedical Engineering discipline are welcome to apply. Besides a good command of English applicants should have a strong interest in regenerative sciences and approximately 6 months of research experience. The major focus of the three year PhD program is an individual research project carried out in the principle supervisor's lab. Furthermore, each student has two co-supervisors whose own research foci are closely related to the PhD project but who come from outside the supervisor's department. During the first two years lab work is complemented by weekly seminars and tutorials taught by REBIRTH faculty members covering the different aspects of regenerative sciences. Additionally, each student follows an individualized curriculum including lectures, seminars, summer schools and the like tailored to his or her specific PhD project. The PhD program covers a total of 300 teaching hours within 3 years. (The complete curriculum of the PhD program 'Regenerative Sciences' is available here.) Students graduate from the program either with a Dr. rer. nat. (life and natural scientists only) or a PhD awarded by HBRS and Hannover Medical School. General information on doing a doctorate in Germany can be found on the pages of Research-in-Germany a page which is published by the German Ministry of Education and Research and is edited by the German Academic Exchange Service (DAAD). In case you haven't finally decided whether to do a PhD or not or whether to enroll in a PhD Program or rather to go for an individual doctorate this test may be of help to you (in German only). Online applications for the program starting in October 2019 are accepted from December 2018 until April 1, 2019.